This is our custom-built Quad 13 AWG (8-conductor) speaker cable with overall (round) rubber jacket, made with Horizon SS8 wire. Quad means it carries four speaker channels for things like sub and tri-amped main speaker sets. This is a heavy-duty round rubber (PVC) jacketed speaker cable with great flexibility. These are excellent sounding cables and are perfect for live sound applications. 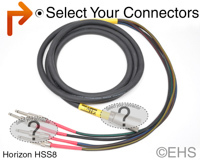 Pick the connectors you need: 1/4", Banana, Speakon, Fork and EP. If you pick 1/4", 4 pole Speakon, banana, or fork it will have a fanout of your selection with shrink color code. We can make these in any configuration and there are way too many to list here, please contact us for additional options if you do not see what you need below. Photo 1 shows 10' cable with yellow master color label and red shrink color labels and 1/4" and EP connectors. Photo 2 shows one option for the two ends with yellow master color label and red shrink color labels and 1/4" and EP connectors. Label: Text label on the "Shrink Color Master"